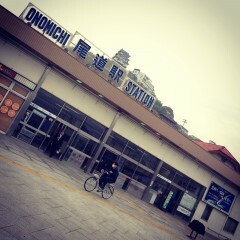 1,On arrival to Onomichi station, get out from the SOUTH exit. 2, You’ll find a narrow sea just in front. 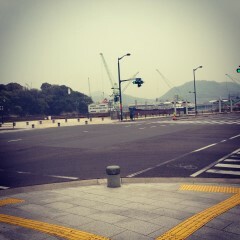 It’s not a river !it’s ONOMICHI SUIDOU, a part of Seto Inland Sea. 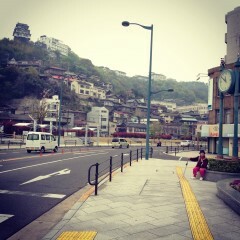 The island in front called Mukaisima, you can go there on a ferry and have a wonderful panorama of Onomichi. After dark, you can enjoy the lighting-up these cranes of dockyards. 3, Cross the road R2, and go to your left. You can find a fake castle on the hill, Mt.Senkoji. 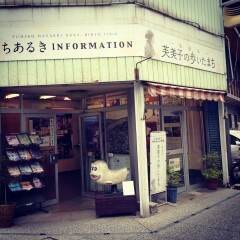 4,You can find a confectionary store “OyatutoYamaneko” on your right hand. 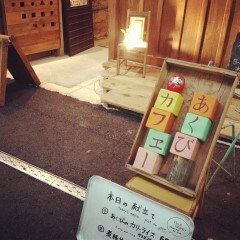 Their pudding is very good and its small bottle is so cute, designed by our guesthouse’s manager Mr.Turu. 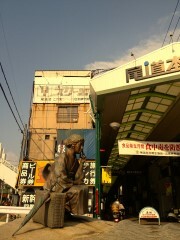 5, There will be found the statue of Fumiko Hayashi, famous woman writer, at the entrance of the arcade. 6, There is an information center on the right side next to the small square. That building is old Chamber of Commerce. 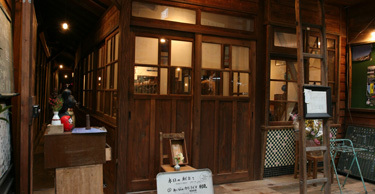 7, You can find a café which was used to be a public bath on the left. 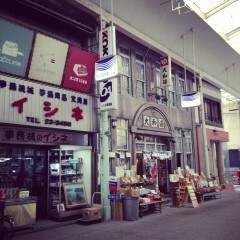 8, There is Qchanride-on on the corner, after the first arcade is finished. There is the central post office between the next arcade. 9, After you see the greengrocery and small fishwagon, Urtraman will come in your sight soon. 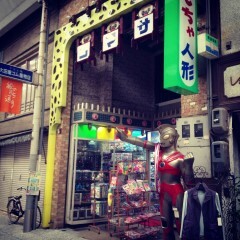 It’s an old toy store and Urtraman is the hero of boys. 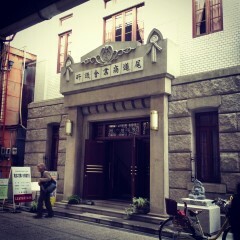 10, When you find a Panda ride-on on the right side of the street, here you are at your guesthouse ANAGO NO NEDOKO! 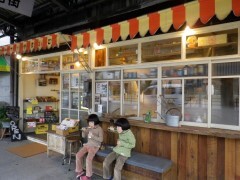 You can enter from the entrance of the AKUBI café in front, but we recommend you to walk into the narrow street just left side of the café to the reception of the guesthouse. Welcome to ANAGO NO NEDOKO and enjoy your stay!